Forza Horizon 4 now available on Xbox One and Windows 10 with Xbox Game Pass. Forza Horizon 4 is now available with Xbox Game Pass and globally on Xbox One and Windows 10. Xbox Game Pass members can start playing Forza Horizon 4 Standard Edition on Xbox One and Windows 10, as part of their monthly membership. The membership includes over 100 more great games, including highly anticipated new Xbox exclusives the day they're released, all for one low monthly price. 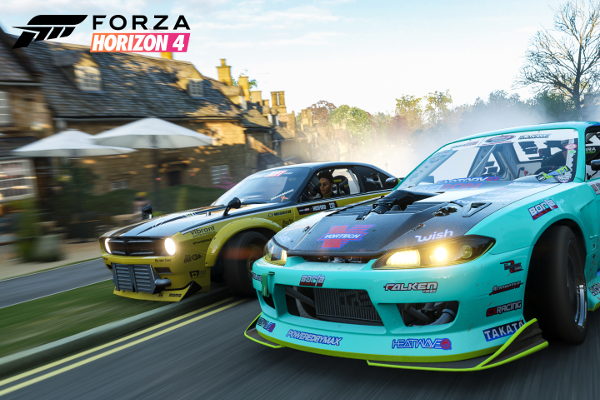 Forza Horizon 4 is a culmination of everything the team at Playground has learned over the past six years creating racing games and has some of the biggest changes to the franchise yet. In Forza Horizon 4, you'll experience new dynamic seasons in a shared open world, set in beautiful, historic Britain. Each week, a new season brings dry, wet muddy, snowy and icy conditions, adding new themed content, gameplay, challenges and rewards to all players across the world - all at once thanks the Shared World. It's easy to become a Horizon Superstar - in Forza Horizon 4, you'll earn influence any way you play. Race on the road, perform stunts, create liveries and designs, explore and drift around the open world, or watch and stream the game on Mixer. In the new open-ended campaign, everything you do progresses your game. In the next few weeks, they will be opening up new Leagues for players to rise through with unique rewards to be won and prestigious Grandmaster titles to aim for. They are also adding one of our most fan-requested features - the Route Creator - shortly after launch, allowing you to map out your own routes for you, your friends and the world to challenge.